Bard is one of the class options for the archetype Healer. This class was first introduced in the Shadow of Nerekhall expansion. The Bard uses his melody and harmony tokens to trigger a vast array of beneficial effects. 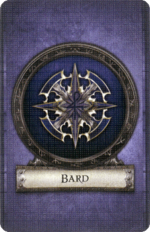 Almost all of the Bard’s Class cards have two effects – one taking effect if the melody token is placed on the card, and the other if the harmony token is placed on the card. By changing his song, the Bard can trigger new abilities in the heat of battle, making sure that the heroes always have the inspiration they need to triumph over the overlord. This class focuses on the use of harmony and melody song tokens to choose from a variety of effects. The Bard's starting equipment its the Traveler's Blade, the Lute, and the skill Song of Mending. Song of Mending 0 Use this card during your turn to place a song token on this card. Understudy 1 Use this card during your turn to place a song token on this card. 턞 Each time a hero within 3 spaces of your recovers 1 or more , he recovers 1 additional . Dissonance 1 Use this card during your turn to place a song token on this card. 턞 If a hero starts his turn within 3 spaces of you, he gains 1 movement point. Aria of War 2 Use this card during your turn to place a song token on this card. 턞 If a hero within 3 spaces of you is attacked, he adds 1 to his defense results. Rehearsal 2 Use this card during your turn to place a song token on this card. 턞 At the end of your turn, choose 1 hero within 3 spaces of you. He may discard 1 Condition card. Concentration 2 At the start of your turn, if both your song tokens are on different Class cards, you recover 1 and 1 . Cacophony 3 Apply +1 to your Stamina (even while this card is exhausted). Wayfarer 3 Apply +2 to your Health. All of your 턞 and 턢 effects apply within 5 spaces instead of 3 spaces. Bard starting weapon Traveler's Blade. Bard starting skill Song of Mending. Bard skill Aria of War. This page was last modified on 24 February 2017, at 00:07.